Perrott states the study has “a high degree of uncertainty”. But this contrasts with the statistical analysis and conclusion of the team of distinguished neurotoxicity researchers from Harvard, the University of Toronto, Michigan and McGill. These researchers have written over 50 papers on similar studies of other environmental toxics like lead and mercury. 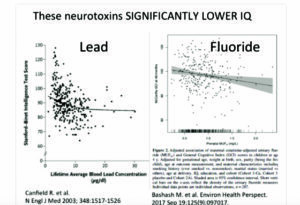 The study reports that for every 0.5 mg/L increase of fluoride in the urine of the mothers there was a statistically significant decrease in average IQ of the children of about 3 IQ points. 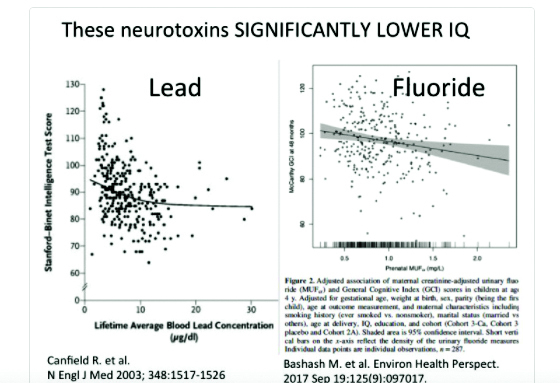 It is therefore correct to say that a fluoride level in urine of 1 mg/L could result in a loss of 5 – 6 IQ points. This is particularly relevant to the New Zealand situation where fluoridation is carried out at 0.7 mg/L to 1 mg/L and fluoride urine levels have been found to be in this range. There is no excuse for Health Minister, David Clark, to continue to bury his head in he sand. This level of science demands that the precautionary principle be invoked and fluoridation suspended immediately. See this piece on Health Central.